It's not everyday that your office takes flight! 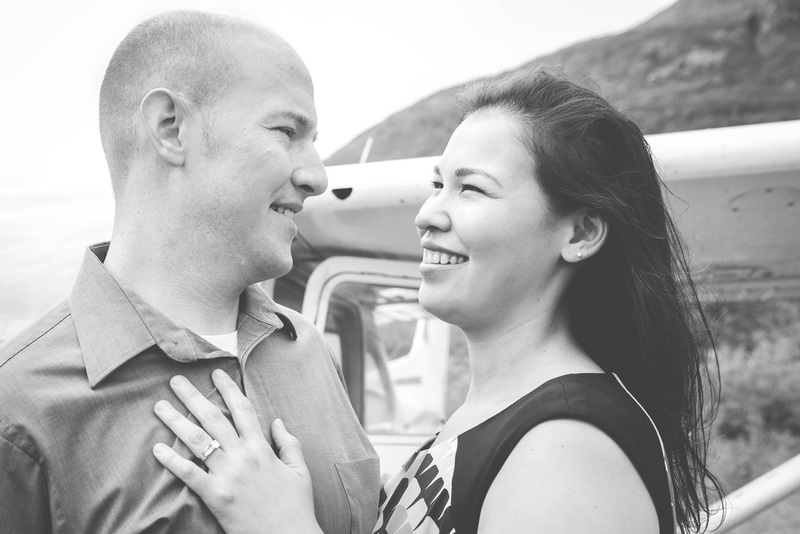 Samantha & Owen's engagement has to be one of the most amazing photography experiences I've ever had. 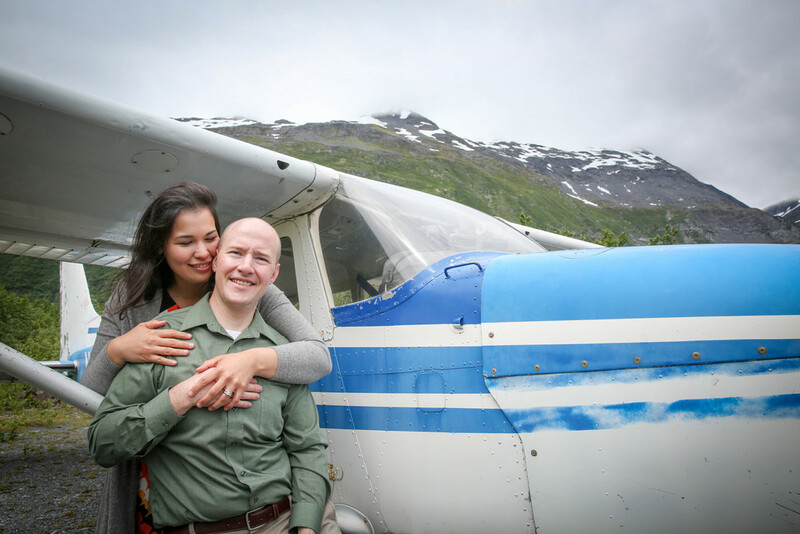 The couple shares a love for aviation and our original plan was to take photos by their plane on Lake Hood. 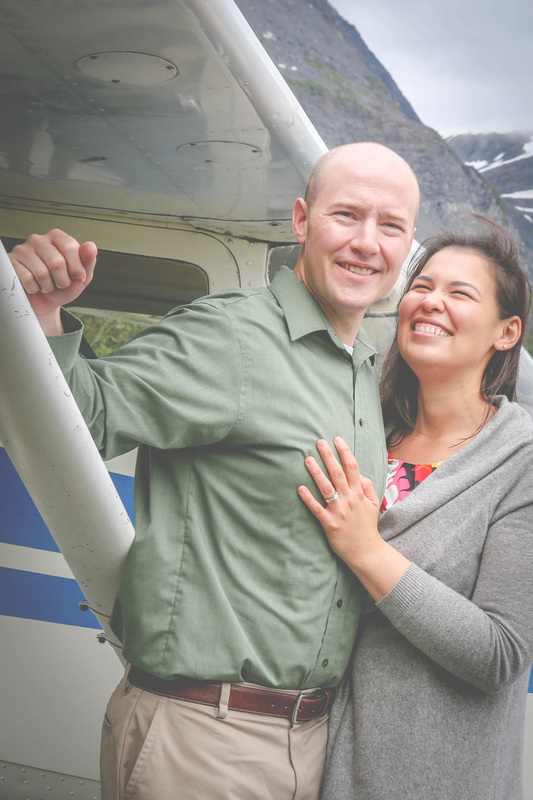 The day before the shoot, I got a text from Sam asking if I'd be willing to go for a plane ride for their Engagement Session. Of course I would! 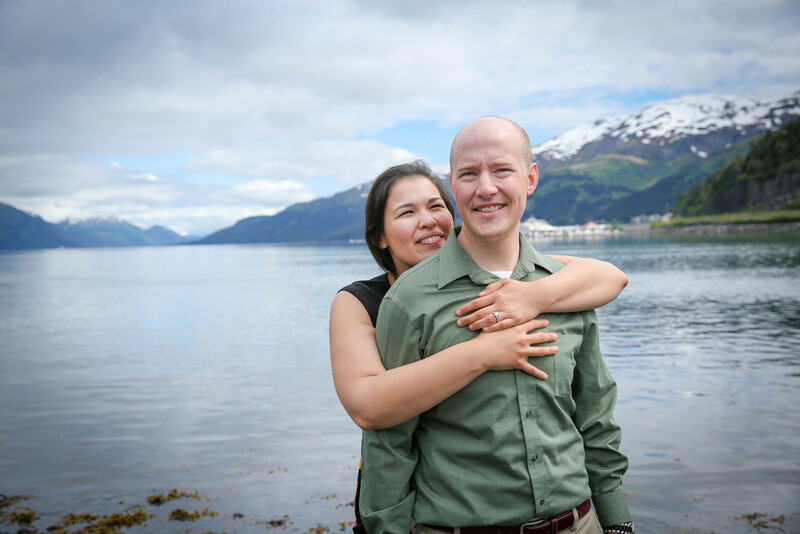 Have I mentioned I love Alaskan couples!? There's something really cool about doing an Engagement Session when the couple must do something together. Suddenly you get to see them in a whole new light and working as a team. And in this case, getting a plane ready to go is not a simple task. I loved how Sam and Owen settled into their familiar rhythms to get ready to go. Sam pulled on her gloves and began removing tie-downs and Owen began checking systems in the cockpit. It was clear this was something they'd done hundreds of times together, and worked through an unspoken checklist using their own form of communication. Have I mentioned I love Alaskan Brides?! Fueling a bush plane takes true teamwork! Samantha's ring on the nose of the plane. Only in Alaska. We circled Hope & Girdwood trying to spot wildlife before landing in Whittier. We saw two different mama bears and cubs frolicking on mountain sides and a Humpback whale! It was breathtaking, and what was so cool about it is Sam and Owen definitely don't take for granted how amazing these flights are. I love the adventurous Alaskan spirit. My personal favorite from our session. Samantha has this gorgeous and genuine smile that is infectious, and I loved the effect it has on Owen in the pictures. For one sequence I told them to try to be serious, knowing it would lead to a giggly Samantha. Once Samantha was trying to keep from laughing, an adorable smirk crept over Owen's face. I love how genuine this photo feels. And we even got some blue skies in Whittier towards the end of our session! Owen designed Samantha's ring and took inspiration from her Grandmother's ring. I couldn't stop taking photos of it in various locations because it is gorgeous! Another tender moment caught on camera. Samantha was worried about her hair looking windblown and "crazy"-- as she put it-- and Owen was quick to help catch flyaways. Samantha found an old rusty rail road spike and a cool rock on the beach. She scratched their names and wedding year on it. Thank you to Samantha and Owen for giving me such a beautiful experience and couple to work with! It was so much fun and I'm so excited for your journey as husband and wife!